Fenton Glass created many colors. Some people refer to this color as satin custard or acid washed. 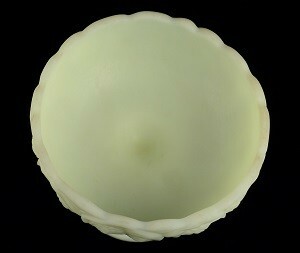 This particular custard color is in beautiful satin finish. The custard satin color was very popular and was introduced in 1972 and used until the late 1980's. The pattern is a water lily and very well executed. 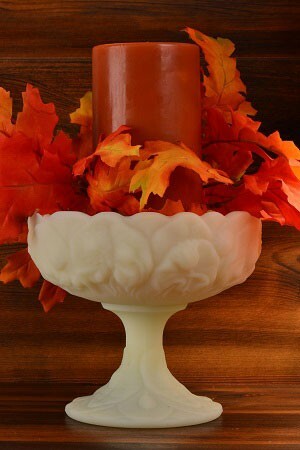 This is a beautiful compote and would make an excellent centerpiece for any table. 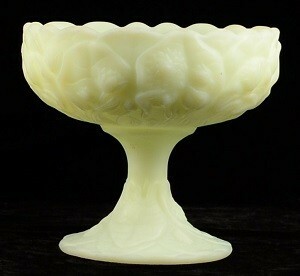 What a marvelous Fenton compote with a variety of uses. This particular compote did not come with a lid as there isn't a rim for the lid to rest on. Exceptional compote in that it is undamaged, no chips, no cracks, no scratches. Any non-perfections are from the firing/manufacturing process. Dimensions are below. H: 5 3/8", Base: 3 7/8" , Rim: 5 1/2"